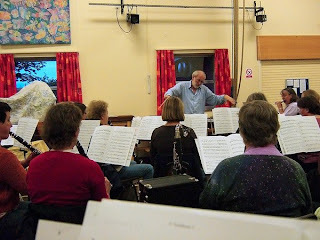 One of the pieces we played last week was Guy Woolfenden's Gallimaufry. Here is Robert Roscoe wielding the baton in one of those quiet trombone sections (click on pic for larger version). It strikes me some of the movements have slightly odd names: Inn and Out, Starts and Fits, Father and Son (and there are more). I expect we'll perform it publicly in a few months, so those of you who aren't playing can come and hear us then. Meanwhile, you can listen to this 1988 performance by a Gwynedd youth band. Who is the mystery player on the left, or is it a ghost? I guess we needed a Siren.